When it comes to fishing well, a good sharp hook and strong fishing knots are essential elements. You may have got the best rod and the best bait out there, but without effective fishing knots, your big catch may well become a big miss! Most of the break-offs in fishing can be caused by badly tied knots, so it is imperative you familiarize yourself with a number of reliable fishing knots in order to stay afloat with the hobby. Choose the right knots for your own style and for the fish you are trying to catch, and tie them correctly, using either printed instructions or a video lesson, and be sure to take your time when doing so. Once tied, lubricate the knot with a little liquid and then draw it tight. 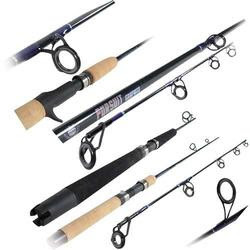 A good fishing enthusiast only needs maybe three or four reliable fishing knots in their arsenal, but be sure that the fishing knots you choose are suitable for the kind of fishing that you do. Choose the most effective knots for your own style of fishing and for the general type of fish you are trying to catch, and test them out until you are very familiar with the practice of tying them correctly. That's a very important factor - you need to be able to tie these knots easily and quickly without having to use any reference. Be it the Albright knot, the Clinch knot or the useful Palomar knot, make sure you can tie it accurately and firmly, and make sure it is lubricated before it is used. Don't try and get it perfect all at once- as with any aspect of the hobby, it can only be perfected over time with a little patience and dedication, so do expect to get it wrong a few times before you tie the perfect knot for your own fishing adventures. The very best fishing knots advice is simple: Find your most effective knot and learn to employ it quickly and accurately.